I was testing various things in sql developer and you'd think I'd know what's in there but not so. 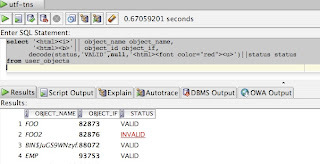 As most people know sql developer uses swing for the UI. Swing components allow you to render the content as html. This is really easy for example a JLabel.setLabel('<html><b>hi') will bold the text hi. The limitation is it's html 3.2 in java 1.5.